God of War Part #7 - Sleep of Bronze continues to be thread MVP. Part 7: Sleep of Bronze continues to be thread MVP. 1) Let's just look at the word Cyclops. It's actually a description, not an abstract name, and you can work it out just from your knowledge of English, since so much of our language is derived right from Latin and Greek. Take a couple of seconds to try it. Alright, clues? κύκλωψ, kyklops, cyclops. Cycl-ops. Cycle-ops. Cycle-optics. To be a cyclops isn't to be a one-eye, like you might imagine. It's a round-eye. I mean, that's presumably because when something has one eye, that eye is naturally conceived of as larger and rounder, but still a mildly interesting bit of trivia. 2) There are several depictions of Odysseus escaping Polyphemos' cave as Bobbin described, and they're pretty funny. But I guess Cyclops-sized sheep are going to be big enough for humans to be carried under. 3) The undiluted wine is quite important. 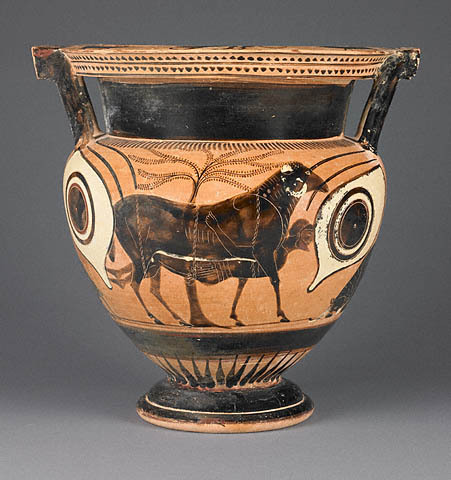 Greeks mixed a fairly substantial part of their wine with water, and considered not doing so barbaric. Polyphemos accepting the wine neat shows his crassness and justifies the deep stupor he falls into. We still have plenty of stories of Greeks getting roaring drunk, so they probably drank quite a bit more to make up for the dilution, and possibly had lower alcohol tolerances. 4)Bobbin mentioned the Titanomachy. μάχη/makhe is the Greek word for battle, and there are a number of important mythological punch-ups which get called the something-machy. The Titanomachy, we've already said, is the war between the Titans and the Olympian gods. The sculptures on the Parthenon handily show several others. On the east metopes, we think we see the Gigantomachy, the fight against the Giants where Herakles helped the Olympian gods to victory. 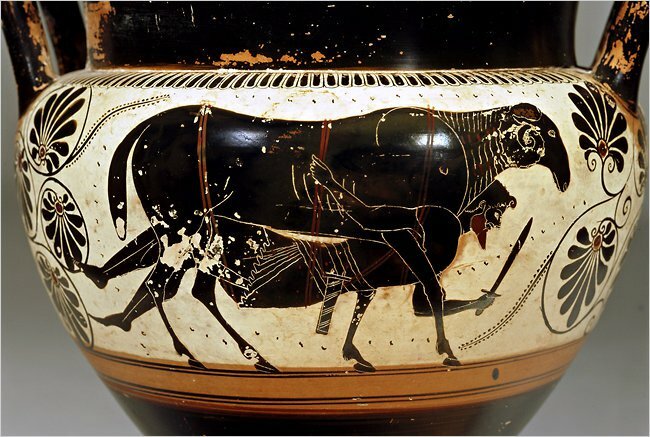 On the south, there is the Centauromachy, a war between the centaurs and the human tribe of the Lapiths, following from the centaurs' drunken behaviour at a Lapith wedding (important to Athens because Theseus was present.) On the west, the Amazonomachy, the war between Athens and the Amazons after Theseus married Queen Hippolyte. One thing I remember reading somewhere is that "Cyclops", "Cerberus", etc. are supposed to be pronounced with a hard "C". So it's more like Kyklops and Kerberos. Except that nobody pronounces them that way any more. Sure. Greek has no soft C, or a C at all - everything's kappas, Ks. Latin has a C which it uses to transcribe the Greek kappa (and is where we get the spelling cyclops from instead of κύκλωψ/Kyklops), but that C too is never soft. English is kind of weird that way. Still, not even 1% of the biggest Classics turbonerds will pronounce those words with hard Cs in English. Other languages might have 'proper' pronunciation depending on their own lack/possession of soft Cs, how much they took from Latin/Greek, and how strict their scholarly community is about using stuff right from the source language vs naturalised forms.